A bazaar (Persian: بازار) is a permanent merchandizing area, marketplace, or street of shops where goods and services are exchanged or sold. Originating from ancient Islamic civilizations, the bazaar is the precursor for the modern day supermarket, flea-market, and shopping mall, and has had a great influence on the economic development and centralization in modern cities around the world. The bazaar first appeared along the important trade routes. The constant flow of foreign and exotic goods, along with travelers, gave rise to systems of haggling and trade within the cities themselves. Special areas of cities were eventually designated as areas of trade, and the first bazaars were established. Bazaars rapidly became areas not just for the trading of goods, but were often the social, religious, and financial centers of cities. With their continuing connection to the religious aspects of life through the presence of mosques in the close vicinity, and their attraction to tourists, bazaars have retained more of a historical and local identity than the Western mall. The bazaar has a long history and has served all segments of society well; it continues to develop and modernize externally, retaining its internal character and purpose, it maintains its place in modern society. The word bazaar derives from the Persian word bāzār, the etymology of which goes back to the Pahlavi word baha-char (بهاچار) meaning "the place of prices". During the time of the Crusades, when Europe and the Middle East had their first major encounters and cultural dissemination took place, the word was assimilated into Italian as bazzara, before being transferred to English in its current form, bazaar. While currently the word is most often used to denote outdoor shopping areas, particularly those of Islamic origins, the word is sometimes used loosely to refer to such places and events as flea markets or swap-meets. The bazaar first appeared in the Middle East, around the fourth century. At the time, the area was often at the axis of many important trade routes, which helped establish cities and ports. A constant flow of foreign and exotic goods, along with travelers, gave rise to systems of haggling and trade within the cities themselves. Special areas of cities were eventually designated as areas of trade, and the first bazaars were established. A strong economy has always been an Islamic ideal, so the bazaars were incorporated and actively fostered when the Islamic conquest swept over the region. Bazaars became areas not just for the trading of goods, but were often the social, religious, and financial centers of cities. Mosques and coffee shops were often incorporated into established bazaars, as were forms of street entertainment. The idea of a bazaar was carried along trade routes, to east in areas of modern day Afghanistan, Pakistan, India and certain areas in South-East Asia, North to modern day Turkey, Hungary and sporadically into areas of Central Asia. However, the major world bazaars continued to be found in Middle Eastern states, as they still are today. Khan el-Khalili, Cairo - ca. 1880s. Khan el-Khalili (Arabic: خان الخليلي) is a major souq in the Old City of Cairo. The souq dates back to 1382, when Emir Djaharks el-Khalili built a large caravanserai (خان khan in Arabic) in Cairo under the Burji Mamluk Sultan Barquq; the eponymous khan is still extant. The souq is noted for selling good-quality clothing, cloth, spices, souvenirs, and traditional jewelry and perfumes at reasonable prices. Imitation Western perfumes are also produced, but tend to be of inferior quality. In addition to shops, there are several Arabic coffeehouses (مقهى maqha or قهوة qahwah, depending on dialect), restaurants, and street food vendors distributed throughout the market. The coffeeshops are generally small and quite traditional, serving Turkish coffee and usually offering shisha. The Al-Hussein Mosque is also in Khan El-Khalili; Al-Azhar University and its mosque are not far away. The market was a target for terrorism during the spate of attacks in Cairo in April 2005. The suicide attack in the market, on April 7, took 21 lives (eleven Egyptians, two French tourists, one American, and seven foreigners of unidentified origin). It was the first attack in the series; this attack scared away tourists from Egypt in general and Khan El-Khalili in particular for some time. Tehran's Grand Bazaar, is the world's largest bazaar situated in the capital of Iran, Tehran. 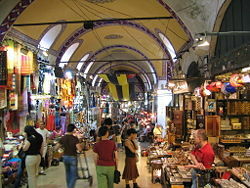 Throughout its history, the Grand bazaar has played host to banks and financiers, mosques and guest houses. Traditionally, the Tehran bazaar was split into corridors, each specializing in different types of goods, including copper, carpets, paper, spices, and precious metals, as well as small traders selling all types of goods. Today, modern goods are available as well, in addition to the many traditional corridor traders that still survive. Despite relying heavily on this historical legacy, much of the bazaar itself was constructed fairly recently. The oldest remaining buildings, walls and passages in the bazaar today very rarely exceed 400 years, with many being constructed or rebuilt within the last 200 years. In this sense, the current grand bazaar is one of the newest in the Middle East. The bazaar is viewed as a force of conservatism in Iranian society, providing strong links between the clergy and the middle class traders. The Iranian Revolution of 1979 received strong backing from these forces. As one of the most important bazaars in the country, the Tehran Grand Bazaar was a center of pro-revolutionary feeling and finance. The Grand bazaar is still an important place of commerce for Tehranis, Iranians, traveling merchants and - increasingly - tourists. However, much of the trade and finance in the city has moved to the north of the city, leaving the bazaar somewhat decreased in importance. Still, in addition to the traditional goods on sale, the market for watches and local jewelry is apparently growing, most likely for the benefits of tourists. As is in keeping with the market spirit, tourists are encouraged to haggle. The bazaar sees the peak of its business at midday and between 5 and 7 in the evening. Amir alley in Tabriz Bazar. The Bazaar of Tabriz, located in the center of the city of Tabriz, Iran, is one of the oldest and largest bazaars in the Middle East. It is said that it is the largest closed one-roofed structure in the world. It consists of some sub-bazaars in various fields, including Amir Bazaar (for gold and jewelry), a shoe bazaar, Mozzafarieh (carpet bazaar) and many other subdivisions for special matters. In modern times in which numerous modern shops and malls have been established, the Bazaar remains as the economic heart of Tabriz. It is also used for the celebration of special ceremonies (especially Ashura). Like other middle-eastern bazaars, there are a numbers of mosques constructed behind the bazaar. Jome Mosque is the most notable of these. 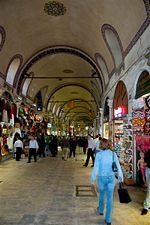 The Grand Bazaar (or Covered Bazaar, Turkish: Kapalıçarşı "Covered Bazaar") in Istanbul is one of the largest covered markets in the world with more than 58 streets and 4,000 shops, and has between 250,000 and 400,000 visitors daily. It is well known for its jewelry, pottery, spice, and carpet shops. Many of the stalls in the bazaar are grouped by type of goods, with special areas for leather coats, gold jewelry and the like. The bazaar contains two bedestens (domed masonry structures built for storage and safe keeping), the first of which was constructed between 1455 and 1461 by the order of Sultan Mehmed the Conqueror. The bazaar was vastly enlarged in the sixteenth century, during the reign of Sultan Suleiman the Magnificent, and in 1894 underwent a major restoration following an earthquake. The Grand Bazaar has four main gates situated at the ends of its two major streets which intersect near the southwestern corner of the bazaar. One street combines the Bayezid II Mosque and Bayezid Square with Nuruosmaniye Mosque. One of several entrances of the Isfahan Bazaar. An aley in Tabriz Bazaar (special alley for carpet selling). Spice_Bazaar: "The spice bazaar is located near the Grand Bazaar. ↑ bazaar Dictionary.com Unabridged (v 1.1). Retrieved September 14, 2007. ↑ bazaar Online Etymology Dictionary. Retrieved September 14, 2007. All links retrieved December 13, 2016. This page was last modified on 13 December 2016, at 17:32.